While PayPal may be best known for its online payment processing system, it also offers a range of credit and debit cards. PayPal offers a rewards card and a couple of cards with cash back rewards, as well as a simple debit card and a prepaid card. Each offering in the PayPal stable provides a unique option, though only one of these is specifically aimed a business use. However, PayPal’s other options can certainly be used by businesses. If you’re a business owner looking for a new credit or debit card, there’s a chance PayPal has what you’re looking for. But which one is right for your business? Find out below by reading our in-depth breakdown! If youâre keen for a rewards-centric card, PayPal offers the Extras Mastercard. This card is aimed at those who frequently shop at PayPal-accepting merchants and on eBay and offers bonus rewards for gas station and restaurant purchases. When you get your points, youâll be able to score some awards. Every 6,000 points, you can choose to redeem for a $50 credit to your PayPal balance. You can also redeem points for airfare, hotel stays, car rentals, vacation packages, gift cards, or merchandise. As a bonus, this card carries no annual fees, although you will have to pay transaction fees when traveling abroad and the APR is higher than the industry standard. Want all the details? Check out our full PayPal Extras Mastercard review. PayPal also boasts a card with a simple reward scheme in the form of the Cashback Mastercard. This card features a straight 2% cash back across all purchases. Thatâs itâthere are no quarterly category rotations or awkward reward rates to worry about. This is actually one of the few credit cards on the market to rock a 2% cash back rate. This flat rate can make it an appealing choice for businesses that shop across a wide array of categories. Youâll be able to redeem your cash back at any time in the form of PayPal balance cash. This is especially handy if you shop anywhere that accepts PayPal; however, if you intend to use your rewards elsewhere, you will have to manually transfer the balance into your bank account. Like with the Extras Mastercard, this card has no annual fee. It also lacks a foreign transaction fee — a bonus for businesses that require international travel. However, it does include a higher-than-average APR. If youâre curious about all this card has to offer, visit our complete review of the PayPal Cashback Mastercard. Beyond regular credit cards, PayPal also offers debit cards. The first of these is designed specifically to work with your Business PayPal account. Unlike a credit card, you donât need a credit check to receive the debit card. You also donât need to worry about potentially paying an APR because the card simply draws from your available PayPal balance. However, you wonât be able to build up credit when using this card. As an added bonus, PayPal gives an unlimited 1% cash back every month on eligible purchases. Purchases eligible for cash back include (but arenât limited to) those processed as credit transactions. PIN-based transactions wonât qualify. When buying abroad, you will be subject to a 1% foreign transaction fee. When compared to some credit cards, this fee is relatively low. However, businesses with frequent overseas travel may want to look into travel-specific credit cards. Youâll also be able to withdraw cash via ATMs worldwide, although there is a standard $1.50 withdrawal charge. PayPal lets users request additional cards — this is handy if youâre looking to give employees debit cards. In partnership with Mastercard, thereâs a zero liability policy which will help you against fraud-related charges. On top of all this, there are no annual or monthly fees to bother with. If you donât have a Business PayPal Account, PayPal offers a Cash Card for personal accounts. Just like their business alternative, this is simply a debit card and is usable wherever Mastercard is accepted. You wonât need a credit pull while applying nor will you have to worry about paying interest. However, it wonât help you build credit. Unlike their Business Debit Mastercard, PayPalâs Cash Card does not feature any sort of reward scheme. That means this card is just for paying and withdrawing cashâyou wonât be saving money using it. It’s not possible for extra cards to be requested on the same account. Because of this, youâll need employees to have their own PayPal accounts or go a different route entirely. Despite those negative points, you will have protection from fraudulent charges on this card thanks to PayPal and Mastercardâs zero liability program. You also wonât be subject to annual or monthly fees like you might with some credit cards. There is, however, a 2.5% foreign transaction fee and a $2.50 withdrawal fee for ATMs outside the MoneyPass ATM network. PayPalâs final offering comes in the form of their Prepaid Mastercard. This reloadable card is accepted anywhere a Debit Mastercard would be accepted. That includes in-store purchases and orders over the phone or Internet. Youâll be able to request a card without needing a credit check. Because itâs prepaid, you also donât have to worry about any sort of interest. However, just like with the PayPal debit cards, using this prepaid card wonât enable you to improve your credit score. There is also a $4.95 plan fee due monthly. To reload this card, you can use your PayPal balance. You can also top up at over 130,000 NetSpend Reload Network locations across the country. Additionally, there’s a direct deposit option that enables users to have paychecks, government benefits, and tax refunds directly deposited to a cardâs account. Beyond the cardâs standard features, PayPal provides occasional rewards for using the Prepaid Mastercard. These rewards come in the form of money-saving offers based on your shopping history. You can also open an optional tiered-rate Savings Account through The Bancorp Bank and earn up to 5% Annual Percentage Yield (APY) for balances up to $1,000. As another reward bonus, the PayPal Prepaid Mastercard features a refer-a-friend program. This program will give you $5 for every friend you get to sign up for the card and load $10 onto it. 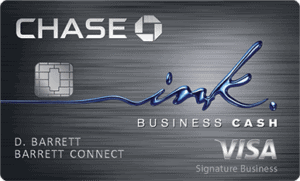 Chaseâs premier business rewards card is their Ink Business Preferred offering. This card is geared towards businesses focused on travel, but it has plenty of other perks, too. Youâll collect three points per dollar spent (up to $150,000 combined) on travel, shipping purchases, Internet, cable and phone services, and on advertising purchases made with social media sites and search engines each account anniversary year. Everything else nets one point per dollar. Points can be redeemed for 25% more value when you book travel through Chase Ultimate Rewards. There are also 80,000 bonus points handed out once you spend $5,000 in your first 3 months. Do note, however, that this card carries a $95 annual fee. For more details, check out our complete Chase Ink Business Preferred review. For cash back, itâs hard not to like Capital Oneâs Spark Cash for Business. Like the PayPal Cashback Mastercard, this card doles out an unlimited 2% cash back on all purchases. It also features a welcome offerâsomething not included with either of PayPalâs cards. With Spark Cash, youâll collect a $500 cash bonus after you spend $4,500 on purchases within your first 3 months. And because itâs aimed at businesses, employee cards can be requested for free. There is a $95 annual fee to consider, but Capital One waives it your first year. 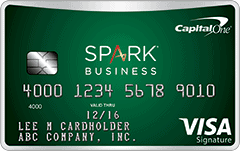 If youâre looking for a cash back card with no annual fee, Capital One also offers their Spark Cash Select with an unlimited 1.5% back. Want the complete Spark Cash breakdown? Read the full deets with the Merchant Maverick review. Chase also offers a cash back card with their Ink Business Cash. Unlike either the PayPal Cashback Mastercard or the Capital One Spark Cash for Business, this is a cash back card with a tiered reward scheme. You can expect a whopping 5% back when you make purchases at office supply stores and on internet, cable and phone services (up to a combined $25,000). Youâll also nab 2% back when buying at gas stations and restaurants (also up to a combined $25,000). All other purchases collect 1% back. The welcome offer grants you $500 bonus cash back after you break $3,000 on purchases in your first three months. You also wonât have to worry about interest for the first 12 months thanks to the cardâs 0% introductory APR on purchases and balance transfers. Plus, thereâs no annual fee to boot. Get the full look at the Chase Ink Business Cash by reading our in-depth review. For aÂ business looking to get a new credit card, PayPal offers two good options. Their Extras Mastercard is a solid selection if your business frequently shops in one (or more) of the bonus categories. The Cashback Mastercard, on the other hand, is an excellent tool for businesses that donât match up with the bonus categories of the Extras Mastercard. If your business isnât in the market for a credit card, but you still want to be able to swipe plastic with your PayPal account, the Business Debit Card is a great option. With easy access to PayPal funds, the ability to request additional cards, and 1% cash back, this debit card is a simple and obvious addition to any Business PayPal account. The personal debit cards, meanwhile, might be best suited for employee personal accounts. They just donât offer enough advantages compared to the Business Debit Mastercard. Instead, they might work best if an employee is looking for an alternative or something in addition to their bank account. Regardless of whichever route you choose, PayPal has numerous card options for businesses looking to get more out of their PayPal account. Curious about using PayPal to acceptÂ payments? Check out our review of PayPal’s payment processing platform. If youâre considering a loan in the near future, learn more about PayPalâs Working Capital program. The post Paypal’s Credit Cards VS PayPal’s Debit Cards appeared first on Merchant Maverick.